There are number of ways to keep shoes organized. Over-the-door organizers might be good for a dorm room but they are not the best choice for storing shoes. We prefer real shoe racks to keep the shoes in proper shape and under control. 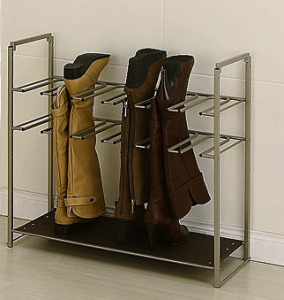 This Whitmor shoe rack is ideal for the bottom of closets. It will hold 20 narrower shoes and 16 wider ones (such as boots and men’s shoes). It is sturdy and easy to assemble. There are couple of other good quality racks that are taller and can hold up to 50 pairs or up to 40 pairs of shoes. 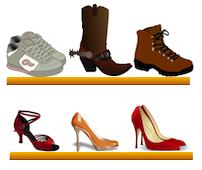 You can see more shoe racks on Amazon if these are not what you are looking for. Open shoe racks are good for closets but they can be unsightly in plain view. If you are accustomed to taking your shoes off at the door a shoe cabinet or a shoe bench is much more pleasant to look at. These are not so easy to find locally but there are a few on Amazon. A few years ago we purchased a perfect shoe cabinet from Home decorators but unfortunately they no longer offer it. The Essex Shoe Storage Cabinet is the closest to the one we have. It is offered in cream and cherry finishes. It is designed for storing shoes. At 16″ deep it is deep enough for large ankle boots as well. It also has three top drawers for small items such as gloves, hats, keys, etc. It measures 23″Hx42″Wx16″D. There are many other shoe cabinets but they have completely different design. Most are with pivoting drawer which can hold only flat shoes and no boots. We think that shelves are the best option for storing shoes if you care about their shape. Shoe benches have the added benefit of providing a place to sit when taking off or putting on shoes. They are typically higher than a chair, though. 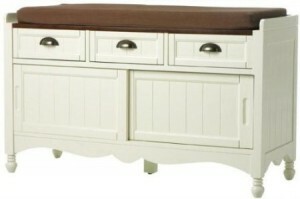 The Southport shoe bench is very similar to the above shoe cabinet in both design and size (25″Hx42″Wx16″D). It comes in ivory finish only. We like this design because the shoes are not in plain sight. Most of the other shoe benches have an open front without doors. This rack is a necessity if you are wearing a lot of tall boots. It is stable and accommodates 6 pairs. It is also stackable so a second one can be added on top of it. It holds the boots straight and in shape. A similar wall-mountable rack is also available. 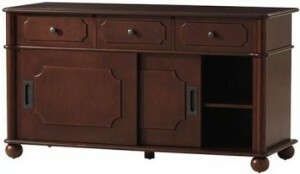 And if you prefer a closet-type storage unit, Household Essentials offers one.